What are your requirements for audio furniture? Fine furniture design? Rigid structural stability? Audiophile performance? You can enjoy it all when you choose Sanus audio furniture. 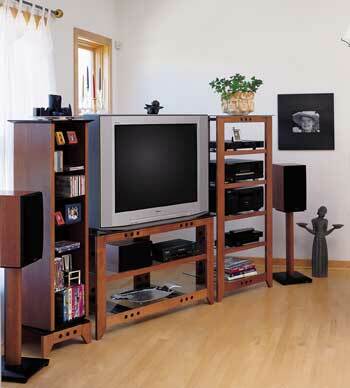 The Sanus Audio Rack family includes seven beautifully functional lines to match any décor and budget. CF5 5 Shelf Steel Audio Rack w/Black Lacquer Trim, 20"x20"x45"
Add 10% for wood or Glass shelves. 32" x 3" x 20"
4.5" x 14.5" x 6"
Freight is additional on all Stands!